I'm a bass player. 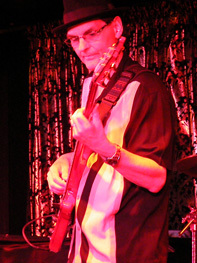 I play the bass for the Laurie Morvan Band (LMB). They call me "Pretty Boy Pat". I am writing this as there has been some interest in what a bass player's life is like in a working band. I will be adding to these writings as events unfold during our travels on the road and working from our home base in southern California. Here is a little of my history. I got the bug to play guitar and bass in my early teens and I have been going strong for the last 40 plus years. After playing guitar and bass in many bands I went back to college to earn a degree in music with the emphasis on bass. I've worked as a music teacher in public education, which has its own rewards, but none is more rewarding than playing with a bunch of talented musicians as are in the LMB. Laurie is an inspiring song writer/guitarist. She challenges her band members to reach for excellence in serving the song to the best of your ability. Kevin is an amazing drummer with the capability to play solid impeccable time. His fills are well thought out, excellently executed, and always service the song. If you have been reading this blog, I thank you for taking interest in what we are doing and I hope that you have been enjoying it. If you would like to respond to any of this or give me some new material you can contact me by sending an email to morvan(at)ca.rr.com. (Replace (at) with @ when sending an email).